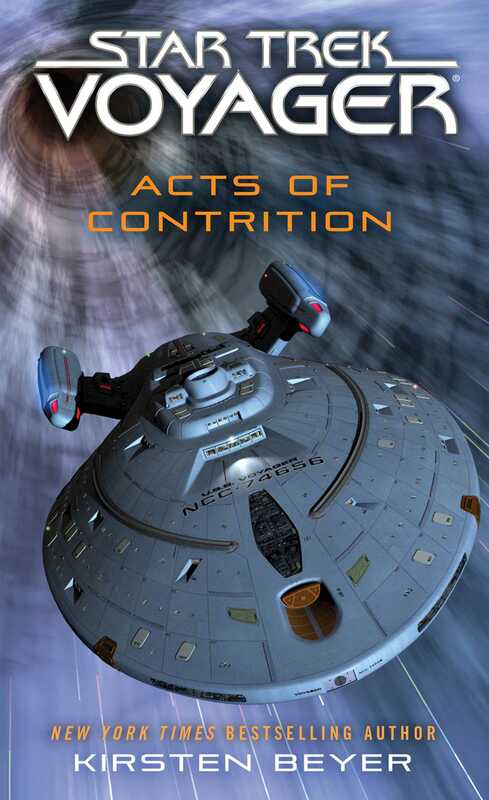 An original novel set in the universe of Star Trek: Voyager—and the sequel to the New York Times bestseller Protectors! Commander Liam O’Donnell had never served on a ship the size of the Vesta. He estimated it could hold twenty Demeters, the special mission ship attached to the Full Circle Fleet that was his responsibility. He lost his way three times between the shuttlebay and Admiral Kathryn Janeway’s quarters. It was possible he wasn’t lost, so much as dreading making his request of the fleet’s new commanding officer. He paused for almost a full minute once he reached her door before activating the chime and announcing himself. “Commander O’Donnell,” Janeway greeted him as he stepped over the threshold to her private office and residence aboard the Vesta. He had seen her once before, at the memorial service on New Talax, and they hadn’t spoken that evening. She was shorter than he remembered—diminutive, in fact—but her stature was the only small thing about her. A genuine smile of welcome radiated over her fair face as she moved toward him, extending her right hand and grasping his firmly. Her presence easily filled the room, giving the space a warm, homey feel. She even made the incredibly restrictive full-dress uniform she wore look comfortable. O’Donnell sighed as he released her hand. No one who knew him had ever been this happy to see him. “Thank you, Admiral,” he responded uneasily. He noted her smile falter and added keen awareness to the list of attributes he was in the process of applying to Janeway. “Obviously there won’t be time now to hear your full report,” Janeway began. Janeway stepped back, analyzing him without making her attention feel intrusive. Quite the diplomat, O’Donnell added to his list. “Is there a problem?” Janeway finally asked. “Your definition of the term, Admiral,” O’Donnell clarified. “Request permission not to attend the ceremony tonight, Admiral,” O’Donnell said. He read more curious amusement than anger at his request, which was a good start. “I’m really not good at parties,” O’Donnell replied. The admiral crossed her arms at her chest, her eyes shining mischievously. “All the more reason you don’t want me there,” O’Donnell insisted. “You’ve been the Federation’s chief representative among the Confederacy for almost two weeks,” Janeway said. “Was it a mistake to ask you to assume that role?” she asked. Janeway chuckled. She seemed to consider taking mercy on him, but the amusement fled quickly from her face. “Request denied, Commander,” she said with finality. “Aren’t they more likely to take my genuine discomfort and displeasure at attending the function as an insult?” O’Donnell asked. “If you allowed yourself to betray any of those emotions, I’m sure they would,” Janeway replied. “So you will be your best, most personable self tonight. Do I need to make that a direct order?” she asked. “And how is that, Commander?” Janeway asked. “Of course, Admiral,” O’Donnell agreed. “I’ll see you in the shuttlebay at 1800,” Janeway said, dismissing him. As Commander B’Elanna Torres’s fingers slipped and failed to close her full-dress jacket for the fifteenth time, she cursed under her breath. Her daughter Miral was watching her closely, and she took great delight in repeating every word that fell from her mother’s lips at the most inopportune moments possible. Come on, Torres thought, gritting her teeth, wiping her sweaty fingers on her pants and redoubling her efforts. “There’s still time to replicate a new one,” suggested Lieutenant Nancy Conlon, Voyager’s chief engineer and one of B’Elanna’s closest friends. Conlon wasn’t attending the ceremony and had offered to play with Miral until her bedtime. Both were sprawled on the floor of Torres’s quarters amidst magnetic building blocks, but neither had eyes for anything at the moment beyond B’Elanna’s attempt to force herself into her dress uniform. “I don’t need a new one,” Torres insisted. “This is already a full size larger than my normal one.” Releasing all of the air in her lungs and pulling her abdomen into its flattest orientation, she refused to take another breath. Finally, the jacket relented. “See?” Torres said, raising her hands to pose for them. Conlon bit both of her lips to hide a smile. Dropping her arms, B’Elanna ducked into her bedroom and examined her reflection in the full-length mirror affixed to the wall beside the threshold. There was no arguing that the jacket was now closed, but it was already pulling apart and the fabric stretched unflatteringly across her stomach. More important, the short waist of the jacket emphasized her rounding lower abdomen rather than drawing attention away from it. “Damn it,” Torres said without thinking. “Damn it,” Miral instantly repeated from the living room. “Miral Paris,” Torres said, the warning clear in her voice as she returned to the living area and crossed to the replicator. “Sorry, Mommy,” Miral said instantly. “I bet you are,” Conlon said. “But when you and Daddy aren’t here, I get to be the mommy,” Miral insisted. “You get to be the big sister,” Torres corrected her gently. “My daddy went home,” Miral said, her face suddenly clouding over. Miral sighed. She was doing her three-and-a-half-year-old best to accept the sudden departure of her beloved daddy. It had been more than a week since he left, and her fits of sudden sadness were most intense near bedtime and first thing in the morning. “I want my daddy,” she finally admitted softly. “I know,” Torres said, pulling her into a tight hug. “I was thinking that instead of playing here tonight, I might take you to one of my favorite ice cream shops on the holodeck,” Conlon said, rising and crossing to Miral. Miral’s eyes widened as she nodded. Torres mouthed a sincere “thank you” to Conlon as she led her daughter toward the door. Voyager’s chief engineer nodded knowingly, then bent to whisper something in Miral’s ear. “Love you,” Miral replied as she tugged Conlon out the door. Ten days before, it would have been Tom complimenting her appearance. Torres would have reveled in his words, knowing that her swelling belly truly was a thing of beauty to him. By now he was back on Earth, preparing to meet his mother in a series of court-ordered mediation sessions meant to determine their fitness as parents and the ultimate custody of Miral and her unborn brother. They had argued right before he left. The memory of it still stung, the only sign of life in an otherwise suddenly lonely heart. Not long before, Torres’s life was near perfect. She hadn’t seen it, of course. You never did until it was gone. With a Herculean force of will, Torres set these dispiriting thoughts aside, squared her shoulders, and departed for the shuttlebay. Counselor Hugh Cambridge was due in Voyager’s shuttlebay for transfer to the First World of the Confederacy of the Worlds of the First Quadrant. To arrive late was to court the displeasure of his commanding officer, Captain Chakotay, and the new fleet commander, Admiral Janeway. The computer had alerted him to the Doctor’s arrival on Voyager, and for the next few minutes, his duties could wait. Cambridge had learned days earlier that Seven was lost to him forever. It was possible he was transferring his understandable anger and disappointment with Seven onto the Doctor. But Cambridge didn’t think so. The Doctor had been the prime mover in the series of events that had ended with Seven’s departure from the fleet. The counselor did not make a habit of sharing personal matters with the rest of the crew. His position required a well-honed detachment. In this case, however, he had decided to make an exception. He owed the Doctor pain, and once he had fulfilled this obligation, his own was sure to diminish. He found the Doctor standing in his small office, conferring with a nurse. Though assigned to the Galen for the fleet’s mission, the Doctor had been temporarily transferred to Voyager when Seven’s CMO, Doctor Sharak, had been ordered to accompany her to Earth. Cambridge had not seen nor spoken to the Doctor in almost two months. For a moment, the Doctor appeared stricken. Then, ever so briefly, a strange serenity descended over his features. He crossed to stand directly in front of Cambridge and raised a medical tricorder between them, directing it at the counselor. “What are you doing?” Cambridge demanded. “With me? Nothing,” the Doctor replied. “Seven did ask that I keep my research private, but shortly after I reached the Beta Quadrant and began treating the former Borg drone known as Axum, I was ordered by my superiors at Starfleet Medical to brief them on all of my work related to Seven and her catoms. Naturally, I found the orders ethically troubling, but Admiral Janeway assured me that it would be a violation of my duties as a Starfleet officer to refuse the direct order. Moreover, once I realized the nature of the medical threat now facing several Federation worlds, this new ‘catomic plague,’ I was certain that were she free to do so, Seven would agree to the disclosure. Perhaps you do not know her as well as I do, Counselor,” the Doctor said. Not for the first time, Cambridge wished he could punch the hologram in the face. “She suffered a great deal before that relief came, Doctor,” Cambridge said. “So you’re sleeping just fine these days,” Cambridge said. Cambridge considered him carefully. Were he human, as he appeared to be, a diagnosis would be easy enough to reach. But he wasn’t. He was a sophisticated holographic program that, according to the “experts,” had transcended its basic directives and attained sentience. He was more like a new life-form, one that, until this moment, Cambridge thought he’d understood. “You realize that because you did this, Seven will never again return to this fleet?” Cambridge asked. Cambridge waited as the Doctor halted himself midthought. Confusion replaced his anger, followed almost immediately by that odd, flat, eerie calm. “Seven will return to the fleet when her services at Starfleet Medical are no longer required. I will hasten that return by working without cease until I have cured the plague myself,” the Doctor said calmly, almost as if the idea had just occurred to him. “The best minds in Starfleet have already worked without success toward that goal for how long?” Cambridge asked. “Only for those of limited imagination,” the Doctor said. “Axum was her first love. You know as well as I do the power of primacy. Whether the plague is cured or not, she won’t abandon him again,” Cambridge said. Cambridge was at a complete loss. He knew the Doctor had once loved Seven. He knew the Doctor was appalled by her choice to enter into an intimate relationship with the counselor a few months earlier. He suspected that if the Doctor could not have her, he would have done anything, including forcing her into Axum’s arms, to make sure that what she had begun with Cambridge would never have a chance to develop. But to hear him now, the Doctor could have been talking about any member of the crew. The shift between vehement protestation and clinical reserve was astonishing. Cambridge considered the Doctor for a moment longer, then turned on his heel and directed his hurried steps toward the shuttlebay, wondering if the Doctor had ever truly been the man so many believed him to be. The room into which Captain Chakotay and his crew were ushered to wait for their fellow officers attending the ceremony was clearly not often used for this purpose. A small metallic desk had been shoved into a corner with a plant, its large flowing lavender leaves trailing over an indiscernible vase, clearly meant to camouflage the workstation. Chairs were set along three of the four walls, and a small table placed in the center held a carafe of water with several cups stacked beside it. Chakotay suspected they wouldn’t be here long. Neither he nor any of his crew—Fleet Chief B’Elanna Torres, Lieutenant Harry Kim, Lieutenant Kenth Lasren, or Counselor Hugh Cambridge—chose to sit. “What do you think they normally use this room for?” Kim asked of Torres. She seemed annoyed by the question and merely shrugged. Chakotay appreciated the attempt by his acting first officer to make this situation feel normal, but he understood that the tension flaring from most of them was going to be difficult to overcome. Ten days earlier, Torres had been separated from her husband, Voyager’s first officer, Commander Tom Paris, under the most painful of circumstances. Lieutenant Lasren, Voyager’s only full Betazoid, had been selected to attend the ceremony in hopes that his empathic abilities would be useful to Admiral Janeway as she formally opened diplomatic relations with the Confederacy. Lasren did not use his special abilities on a routine basis, and the anticipated stress of doing so was clear on the young man’s face. Counselor Cambridge could usually be counted on to lighten the atmosphere, but his mood had been excessively dark since he’d learned of Seven’s departure. Chakotay knew he needed to make time to speak with Cambridge, but there simply hadn’t been any since Voyager had returned to Confederacy space, bringing the Galen and the Vesta with them. Not to mention the fact that Chakotay had only spoken a few times with Kathryn since she had taken command of the Full Circle Fleet, and none of those conversations had been what he’d hoped for from the woman with whom he intended to spend the rest of his life. He was eager to see her tonight, though he knew the evening would be all-business. Anticipation of her imminent arrival, however, was accompanied by a fair amount of trepidation. “B’Elanna, Harry, Kenth, Hugh,” Chakotay said, immediately drawing the attention of all present to him, “I know things have been happening pretty fast the last week or so. There has been a great deal of change to absorb, much of it difficult. But for the next several hours, we need to set all that aside. Tonight we are honored guests of the leadership of a confederacy of planets that, as best I can tell, is the first we have ever encountered in the Delta Quadrant that rivals our Federation. Commander O’Donnell’s early reports indicate, among other things, that they are incredibly excited to meet with us and explore the possibility of an alliance with our people. I don’t have to tell you what an asset such an alliance would be for our fleet, and the Federation. “Our galaxy seems to have grown a little smaller since the development of our slipstream capabilities. The ‘streams’ the Confederacy uses to traverse the space they claim, subspace corridors that bridge vast distances, have had a similar effect here. Even a few years ago, the thought of entering into relations with a civilization as far distant as this one would have been unlikely to hold the potential for much meaningful exchange of information or resources. That is no longer the case. Starfleet’s most important role is as an ambassador to all warp-capable cultures in the galaxy. Tonight we embody that role. Opinions of the Federation will be shaped by the way in which we conduct ourselves. “Well said, Captain,” a familiar voice noted. Turning, Chakotay saw that Admiral Janeway had entered during his remarks. Always at her right hand was a slightly built Vulcan male, Lieutenant Decan, Kathryn’s personal aide. The Galen’s captain, Commander Clarissa Glenn, the Vesta’s CMO, Doctor El’nor Sal, and her captain, Regina Farkas, followed behind Janeway, along with Demeter’s Commander Liam O’Donnell, who looked as if he had come to attend a funeral, but he nodded in Chakotay’s direction as soon as their eyes met. “Admiral on deck,” Kim said crisply. “Of course, Admiral,” Kim said. Turning to Chakotay, her smile widened. “Captain,” she greeted him. Her eyes held his for a brief moment, and much of the worry he’d felt prior to her arrival dissipated. Janeway nodded, accepting the compliment before moving among Voyager’s officers and greeting each of them personally. She briefly pulled Torres aside, and a firm hug between them suggested that the admiral had just availed herself of her first opportunity to congratulate Torres on her pregnancy. Soft conversations erupted all around as old friends and acquaintances greeted one another. Doctor Sal, a tall woman in her eighties, moved quickly to Chakotay’s side and, without warning, threaded an arm through his. “I hope you don’t mind, Captain,” she offered with a sly smile. “I always like to enter a room on the arm of the best-looking man around,” Sal teased. “I guess you’ll just have to make do with me tonight,” Chakotay teased back. “Is my CMO bothering you, Captain?” Farkas asked, moving to stand before them. “I’m sure it won’t come to that, Captain,” Chakotay said. “It seems we are all present and accounted for,” Admiral Janeway said, raising her voice above the low din. Immediately all other conversation in the room ceased. Nods all around seemed to satisfy the admiral as the door slid open and a tall humanoid in a long tunic that might have been spun from pure gold entered. As he moved, the fabric rippled, more like a liquid than a solid. A wide, long, dark metallic chain draped over his shoulders enhanced the effect by appearing to float on the fabric’s surface. Chakotay knew him to be Leodt, one of the two primary species that had founded the Confederacy. The other was the Djinari. The Leodt’s skin was a deep brown, his eyes black as pitch, and his most striking facial feature was the circle of pointed teeth his thin lips did little to conceal. Janeway immediately moved to stand before him. “It is our honor to be so welcomed,” Janeway said, clearly a rehearsed response, likely settled upon in the negotiations leading up to this moment. “If you will follow me?” Dreeg asked. Chakotay and Sal fell in line directly behind Janeway as the others assumed their preappointed positions for their entrance into the ceremony. Here we go, Chakotay thought.